Steve Jobs, Co-founder, chairman and CEO of Apple Inc. Computers, chairman and guru behind Pixar – he died of pancreatic cancer in 2011. “No one wants to die. Even people who want to go to heaven don’t want to die to get there. And yet death is the destination we all share. No one has ever escaped it. And that is as it should be, because Death is very likely the single best invention of Life. It is Life’s change agent. He talked openly about how his attitude on things changed when he began to consider the possibility of the end. That’s what Peter’s does in our text today 1 Peter 4:7-11. It says, living with the end in mind should change the way we live today. God wants to change the way we live. 1 Peter 4:7–11 (NLT) 7 The end of the world is coming soon. Therefore, be earnest and disciplined in your prayers. 8 Most important of all, continue to show deep love for each other, for love covers a multitude of sins. 9 Cheerfully share your home with those who need a meal or a place to stay. 10 God has given each of you a gift from his great variety of spiritual gifts. Use them well to serve one another. 11 Do you have the gift of speaking? Then speak as though God himself were speaking through you. Do you have the gift of helping others? Do it with all the strength and energy that God supplies. Then everything you do will bring glory to God through Jesus Christ. All glory and power to him forever and ever! Amen. Bring glory to God through Jesus Christ. This series will give us a biblically-grounded framework that challenges and encourages us as believers to align our calling and lives on kingdom outcomes that bring glory to God. 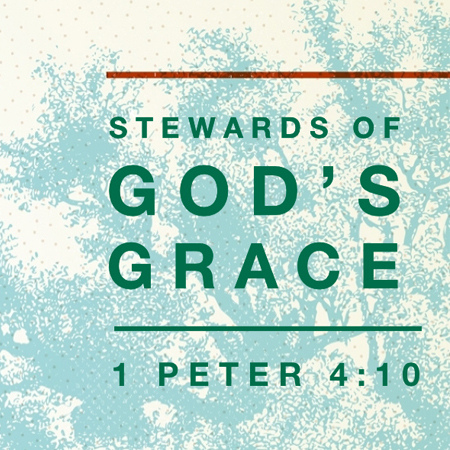 A fundamental way we glorify God is in our being stewards of His grace. No the treasurer hasn’t started wearing sackcloth and ashes. No, we’re not putting parking meters have been installed in the church car park.